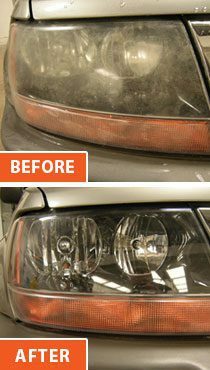 Auto Color can restore cloudy, foggy, yellowed plastic headlights to like-new condition!As many as nine out of ten cars on the road suffer from yellowed plastic headlight lenses. Proper maintenance of your lights improves the looks of your car and safety for driving at night. Rely on the Auto Color team to restore and rejuvenate your plastic headlight lenses. Repairing automotive interior surfaces recaptures the youth of any vehicle. Auto Color can often mend and re-color vinyl, leather, plastic, fabric surfaces and carpet that is damaged. Rely on the Auto Color team to repair your car interior wear and tear or damage issues or problems for much less than replacement cost. Auto Color can help you add style to your great looking car.